We admit service dogs only, as protected under the Americans with Disabilities Act. We do not allow pets or therapy animals at the Gardens. Please see our Policies & Guidelines page for more information. On the first Wednesday of each month, admission is free for all year-round residents of Lincoln County, Maine. Boothbay residents receive free admission on weekends. Residents must show their valid ID with their Boothbay address. The traffic pattern in the Boothbay Common area has changed. Google Maps is updated and correct, but Apple Maps and some others may still be outdated. The image above shows the new traffic pattern. 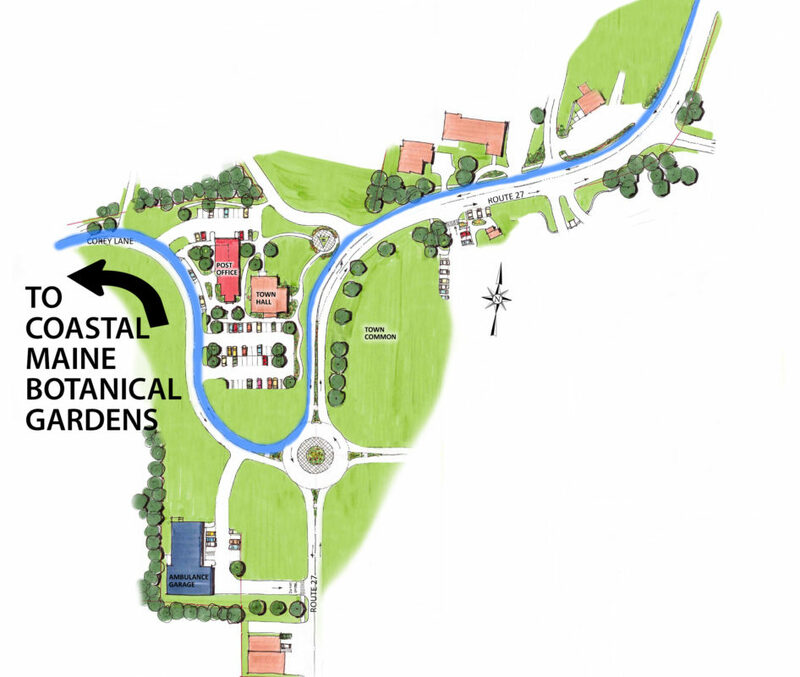 The entrance to Coastal Maine Botanical Gardens is on Barters Island Road in Boothbay, about ten miles from Route 1 in mid-coast Maine. For GPS users, our physical address is 132 Botanical Gardens Drive, Boothbay ME 04537; coordinates are N 43*52.54548, W 69*39.5454. (Please note: On an older GPS, 200 Barters Island Road might work better). Follow signs to the Boothbay region. Soon after crossing the Wiscasset bridge on Route 1 North, turn right onto Route 27 South towards Boothbay. After 9.3 miles, take the first right at the roundabout onto Corey Lane. After 0.25 miles, turn right onto Barters Island Road. The entrance to the Gardens is about 1 mile ahead, on the left. Follow directions to Route 1 South. Continue on Route 1 through Damariscotta and Newcastle. In Edgecomb, turn left onto Route 27 South towards Boothbay. Follow the directions above. Take Route 27 north to the Boothbay Center roundabout. Take the third exit at the roundabout onto Corey Lane. After 0.25 miles, turn right onto Barters Island Road. The entrance to the Gardens is about 1 mile ahead, on the left. Under normal traffic conditions, the Gardens is just over an hour’s drive northeast of Portland. Augusta is under an hour to the west, and Bar Harbor on Mt. Desert Island is about three hours northeast of the Gardens. The Gardens is accessible from the Canadian Maritimes by highway.